Objective carcase grading: What’s coming down the technology super-highway? 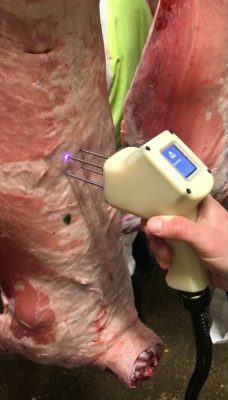 REAL-TIME, objective measurement of profitable carcase traits that determine elements of meat yield and eating quality are getting closer to being delivered commercially by modern scanning and digital imaging technology. A group of beef and lamb producers from Victoria, Tasmania, NSW and South Australia gathered in Melbourne recently for JBS Australia’s Great Southern farm assured program awards were given a rapid-fire update of where various emerging objective carcase measurement technologies are up to. Presenting on the day were MLA’s Richard Apps, who chairs the Advanced Livestock Measurement Technologies (ALMTech) program steering committee, and one of the program’s stakeholders, UNE meat scientist, Dr Peter McGilchrist. Launched two years ago, the ALMtech program now involves 23 industry partners, looking at opportunities to objectively assess features that affect carcase value – yield attributes, eating quality attributes, and potentially, what can be done around food safety issues. Some of the carcase composition technologies also support moves to automate parts of the fabrication process, using robotic saws. While some of the technologies are still in the ‘futuristic’ class, others are well advanced down the commercialisation path, or indeed already in use in meat industries around the world, the pair said. The wide array of emerging technologies under study through ALMTech projects include high definition cameras, X-ray imaging, CT scanning, hyperspectral cameras and other systems, which may have applications in beef and sheepmeat processing, as well as live animal measurements, the JBS gathering heard. “These tools have to be fast, they have to be cost effective, and they often have to work in tough abattoir environments,” Mr Apps said. “Conditions can be hot, wet, cold, and can have lots of electrical motor interference which can muck-up sensitive equipment, so it is quite a hostile environment. These are not trivial challenges at all, if we want them to accurately value our carcases,” he said. On the eating quality side of the research, work was largely focused on various cut-surface camera technologies, while on the yield and carcase composition side, technologies were based around X-ray technologies. E+V rib-eye camera: The E+V camera produced in Europe, assesses the quartered surface at the rib eye. The camera is already in commercial use in the US beef industry for quality grading. About 1500 carcases have already been assessed in Australia using the E+V camera, to help develop calibration to see how well it can be adjusted to produce Australian MSA/chiller grading outputs, rather than US grading systems. The system in use in the US is designed for use in a grading station, which not all processors use in Australia. As it accumulates data under Australian conditions, the E+V camera system was being ‘taught’ how to improve its AusMeat marbling score assessment ability – but for a first attempt, it was producing some excellent data, Dr McGilchrist said. The system is currently going through the AusMeat accreditation process. 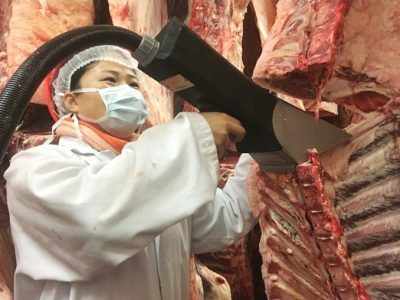 MIJ grading camera (pictured below): Also well advanced overseas is the Meat Image Japan (MIJ) grading camera, which is in use in Japan grading Wagyu carcases, and is about to be adopted by Wagyu supply chains in Australia (see yesterday’s story). Again, it images the cut rib-eye surface to deliver an objective prediction of marbling score, marbling fineness, rib eye area and other traits that the Japanese Wagyu industry values. An example of the camera is in use in Australia, and the Australian Wagyu Association is currently working with the camera and seeking commercial adoption. The MIJ camera appeared to have good potential at the high marbling score end, but data suggested it might struggle at the Australian lower marbling score end, particularly with grassfed or short grainfed type cattle. 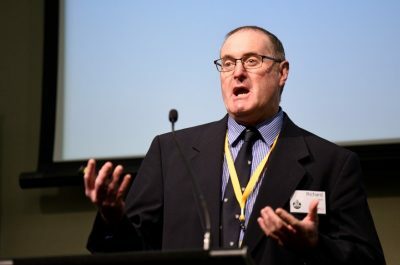 “Accuracy and repeatability is high, but it’s not quite there yet – it’s very suitable for Wagyu and cattle sold into high-end marbling markets, but still needs ongoing development of software to suit MSA grading,” Dr McGilchrist said. 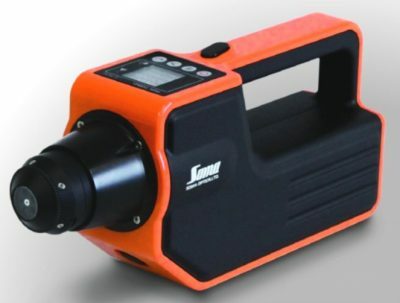 Hyper-spectral camera: While both the above systems use ‘standard’ camera technology not unlike that found in a smartphone or digital SLR camera, these had some challenges when trying to distinguish light reflection on a cut surface, drops of moisture, or potentially, bone-dust on the cut rib-eye surface. All could potentially be interpreted as fat or marbling in the image. Hyper-spectral or multi-spectral cameras are also under examination under the ALMtech program. 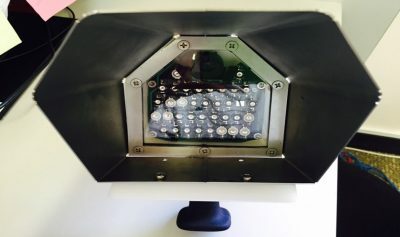 These cameras use a series of diodes (pictured), which put out their own particular wavelength, out of the visual spectrum into the infras-red and near infra-red light ranges. These cameras have some penetrative capacity, and do not just look at the cut surface, but what lies beneath in the muscle tissue. These cameras were already showing quite good potential. Frontmatic (pictured left): The ALMtech program was working closely with Danish company Frontmatic, which had recently assessed 400-500 Australian lambs using its hyperspectral camera technology. Results looked quite promising in being able to predict intra-muscular fat. In principal, it was about taking those multi-spectral image of a cut surface of beef or lamb and using some smart software to differentiate the colours (reflectance/absorbance) from the cameras to predict the tissue type (lean meat, marbling, sub-cutaneous fat around the outside). The system already ‘speaks Australian,’ outputting AusMeat and MSA data. Further work is needed to help the system refine its ability to determine MSA marbling and eye muscle area. Dr McGilchrist was hopeful the system would be presented for AusMeat accreditation by the end of 2018. MEQ probe: Also under examination is a device developed by an Adelaide company called the Meat Eating Quality (MEQ) probe – a small-hand held device using the hyperspectral domain, using four needles fitted with a fibre-optic source, which performs imaging as it is being pushed into the muscle and removed. It’s still early days, but several data sets are showing quite good promise, the Melbourne audience heard. MEQ may have particular application in lamb, which unlike beef is not quartered for grading. Data is being analysed on another 1200 Australian beef carcases. Near-infra red measurement technology is currently used in laboratories and for mineral composition analysis in geology, but not yet in abattoir environments. The two devices shown here have been trialled, and the data looks promising. The next step is to load up meat quality prediction algorithms into the devices, in collaboration with manufacturers. Soma Optics, pictured left, is a small Japanese company which already has NIR devices in use in the Japanese food industry – specifically to measure fat content in high-value fresh tuna. The ALMtech project hopes to access one of the devices for analysis in coming months. 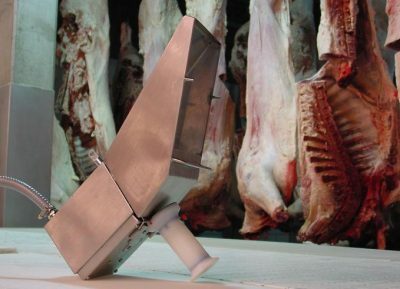 The objective would be to see if it can be calibrated and fine-tuned for use in beef and lamb. Raman spectroscopy is another technology being examined. It has potential for measuring sensory traits, pH, fatty acid and beta carotene content, purge, and grassfed or grainfed verification. As distinct from the measurement of meat quality traits discussed above, another large number of technologies are under examination for use in measuring beef and lamb carcase yield and composition. In one example shown by Mr Apps, there was $600-$700 variation in value within six lines of Angus steer lines representing sires involved in the Angus Benchmarking project. DEXA: Most prominent of these is the single, and more recently dual-energy Xray (DEXA) whole carcase scanning systems installed under trials at a number of plants including Bordertown (lamb), Brooklyn and Teys Lakes Creek. The DEXA systems have two distinct purposes, which can be used independently or combined – to provide yield information feedback on carcases, and to instruct robotic saw technologies on optimum cutting lines in carcases. Beef DEXA development is still at an earlier stage, but good progress was being made, Dr McGilchrist said. Current datasets suggested yield predictions at this stage are not quite as good as lamb, but getting close. “With more data, we are confident we can refine the beef DEXA system,” Mr Apps said. 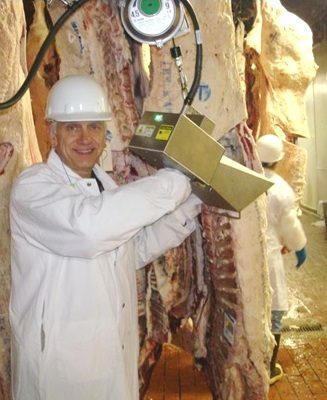 E+V camera: As well as measuring eating quality, the E+V rib-eye camera mentioned above can also be teamed with a second E+V whole-body camera to product carcase yield. Equine CT: Equine CT is a new medical technology developed in the US for race horses, which overcomes the challenge of manipulating large bodied animals or carcases (beef cattle, horses) through a conventional CT scanner, by using rotating CT scanners mounted on two robotic arms. The beef industry is looking at how this early-stage technology might be applied in the processing sector for beef and lamb, and also at the live animal stage. Aviation CT scanners are familiar sights at security stations at airports around the world. 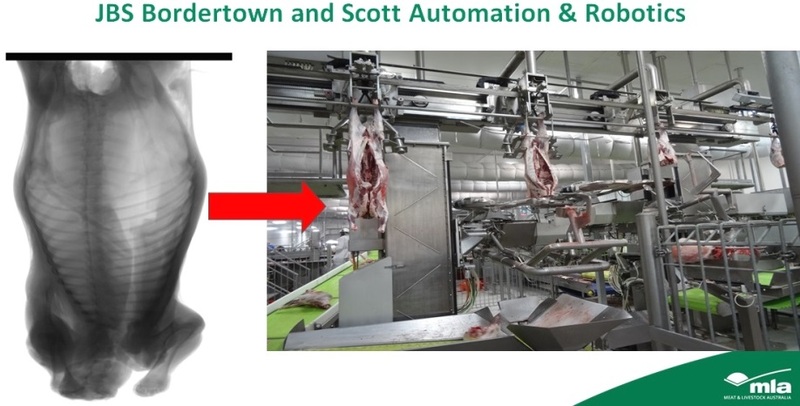 The ALMTech project is talking with Rapiscan, one of the world’s largest suppliers of this ‘industrialised’ CT technology, with a view to application in the beef and lamb industries. Dr McGilchrist also spoke about some blue-sky technologies, including the TenderSpec hyperspectral camera beef classification system, pictured left, which not only measures tenderness, quality and yield grading in carcases, but can potentially also provide information on muscle, collagen and protein structure, and enzyme levels present in each carcase. The system was brought to Australian under an AMPC project for examination, but results are still be determined.